November 2, 2018 November 2, 2018 Hel ReynoldsLeave a Comment on Social Media Marketing Awards: I won! Social Media Marketing Awards: I won! On Monday, I won Freelance Social Media Marketer Of The Year at the Social Media Marketing Awards! I’m super chuffed, especially since I was up against some incredibly talented social media professionals. ‘But, hang on’, you might be thinking, ‘You’re a social media trainer aren’t you?’. My business is currently a one-woman-band and the majority of my work is training communications, PR and marketing people. It’s my mission to inspire people to unleash their creativity and get stuff done. But as well as studying effective social media techniques and classic communications and PR theory, my training is informed by actually working with organisations to design campaigns, create strategies, and create engaging content. The project work I do with organisations is invaluable for sharing real lessons with others. Plus as a keen observer of trends, I can apply my understanding of social media strategies to the campaigns I work on. It’s a win-win situation that makes my work unique, and keeps me buzzing with ideas and excitement for my courses. 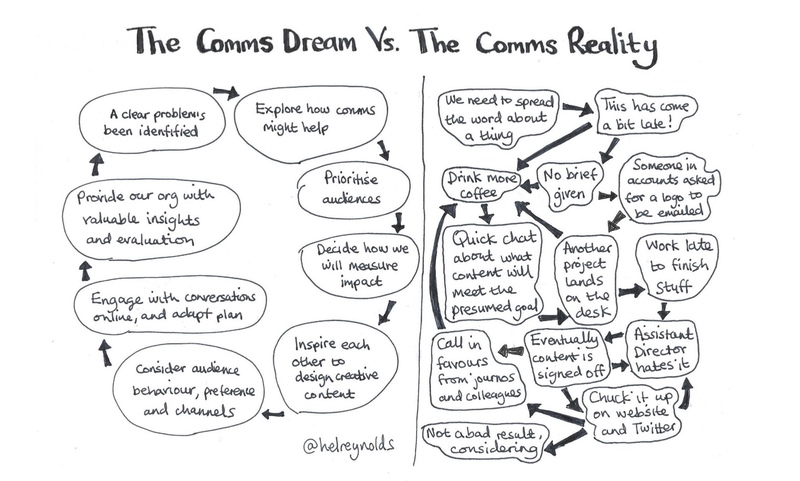 So my knowledge is partly based on recent experience that helps me understand the pressures and realities of working in comms and marketing. This informs my cartoons too! So I feel so lucky and chuffed to be recognised for the work I do with on campaigns like the social housing anti-stigma cause, Benefit To Society, and Disability Wales’s #IAmEmbolden which celebrates Deaf and disabled women creating change. The past year was a bit tough as I tried to balance running a business with a mild but annoying health condition that was tiring me out. I put myself first (obviously!) but the work kept coming in and it all worked out. The award is a real boost and has helped me plot bigger and bolder plans for 2019. Massive thanks to Social Day for putting on the brilliant Social Media Marketing Awards and for introducing me to so many new people that I met at the awards do.